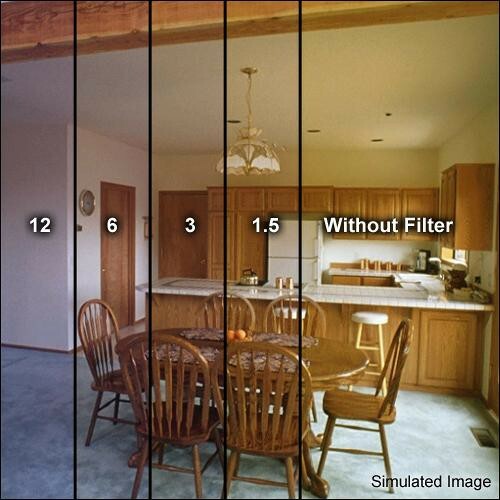 Decamired filters are designed to more easily handle unusual color temperature variations than the previously mentioned filters. Available in increments of both a red and a blue series, Decamired filters can be readily combined to create almost any required correction. In measuring the color temperature of the light source, and comparing it to that for which the film was designed, we can predict the required filtration fairly well. To use this concept, subtract the mired value of the light source from that of the film. If the answer is positive, you need a reddish filter; if negative, use a bluish filter. Mired-coordinated filters are termed as decamireds. Mired value divided by ten yields decamireds. The 60 mired shifts, above, would be produced by an R6 filter, where the higher values were that of the lighting. Sets of such filters generally come in values of 1.5, 3, 6, and 12 decamireds in both B (bluish) and R (reddish) colors. These numbers are additive; that is, a pair of R3's produces an R6. An R6 plus a B6 cancel each other out to produce a neutral gray.